The ozone layer is a layer in Earth's atmosphere which contains relatively high concentrations of ozone (O3). This layer absorbs 97-99% of the sun's high frequency ultraviolet light, which is potentially damaging to life on earth. Over 90% of ozone in earth's atmosphere is present here "Relatively high" means a few parts per million—much higher than the concentrations in the lower atmosphere but still small compared to the main components of the atmosphere. It is mainly located in the lower portion of the stratosphere from approximately 15 km to 35 km above Earth's surface, though the thickness varies seasonally and geographically. A thinning ozone layer leads to a number of serious health risks for humans. It causes greater incidences of skin cancer and cataract of the eye, with children being particularly vulnerable. There are also serious impacts for biodiversity. Increased UV-B rays reduce levels of plankton in the oceans and subsequently diminish fish stocks. It can also have adverse effects on plant growth, thus reducing agricultural productivity. Another negative effect is the reduced lifespan of certain materials. 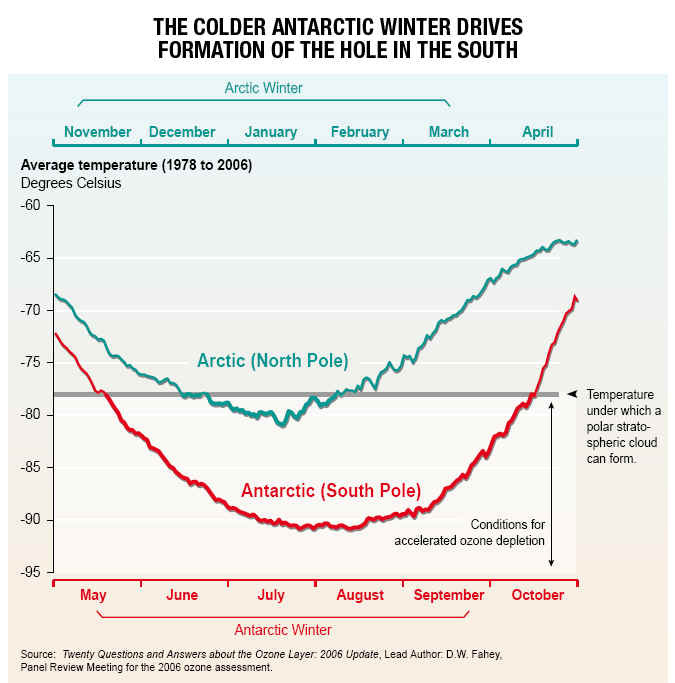 Severe depletion of the Antarctic ozone layer was first observed in the early 1980s. The international response embodied in the Montreal Protocol. Today 191 countries worldwide have signed the Montreal Protocol which is widely regarded as the most successful Multinational Environmental Agreement ever reached to date. Furthermore the phasing out of ozone depleting substances (ODS) has helped to fight climate change since many ODS are also powerful greenhouse gases. 1930 Sydney Chapman describes theory that explains existence of an ozone "layer"